We both really liked the barn setting! Was just a beautiful area what with the drapes and twinkling lights. And I liked how we broke out to the main house for the drinks reception. Also we had people traveling over from Yorkshire so having the rooms were a major plus. Craig proposed in June 2017 we were staying in Keswick lodge retreat for my birthday. The day before my birthday we went on a lovely walk with maya our dog. And over the amazing views of Bassenthwhaite lake he popped the question. Was a perfect spot and the weather was beautiful. Do you have a favourite memory from the whole day? Honestly the whole day was just amazing and truly was the best day. If I had to choose a favourite part was when we walked back down the isle as a married couple! Was the first time I really saw everyone and was just a special moment. Craigs favourite was coming back in to the wedding breakfast as mr and Mrs latham. Shout out to Alex who did all our music, as he suggested playing 99 problems by jay z when we came in! And we loved it having a little dance coming in. Craig now has that as his ring tone when I phone him haha!! Why did you pick RTP to film your BIG DAY? We chose you as We loved your films!!! The edit of them is like a movie. We knew you would capture the moments we wouldn’t have seen, giving us a different view of our day. And when we met you, you were so friendly and put us both at ease. Would definitely recommend you!!!! Any advice for a couple planning their wedding? I would say it’s in the planning and organising. I had lists coming out of my ears! But helped to keep me calm and not stressed. But other then that enjoy it and when it comes To closer to the day don’t be stressing about the little details! Go with the flow. 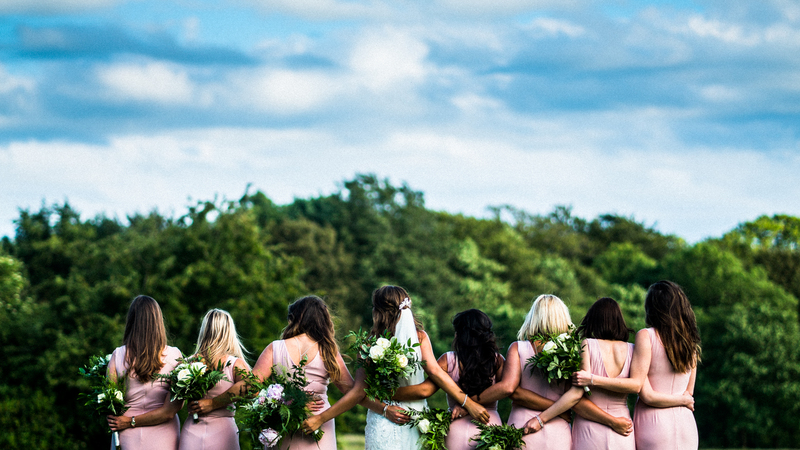 Why did you pick Rivington Hall Barn for your wedding? We picked rivington because as cliche as it sounds it was simply stunning. It was just the vibes we were after, the low lighting, the barn, the drapes, the fairy lights, just all of it. What advice would you give anyone planning their own wedding? Don’t stress! Enjoy all the planning & enjoy every minute of the day because it goes too quickly, everybody kept telling us to make sure we had a moment alone together on the day so we did & really glad we did because it was special watching everyone enjoying themselves & dancing etc! We know it’s tough but if you had to pick a favourite moment from your amazing day, what would it be? Favourite moment, wow that is hard.. we loved all of it! Getting ready before hand was so much fun, the build up and then being together at the top of the aisle was pretty special. Just all of it, dancing with everyone at night & the speeches, the confetti drop, the sparkler send off, the wedding night haha! Please can we do it again? What made you choose Owen House Barn for your BIG DAY? We wanted a barn wedding as it was in October, we really liked the idea of a venue that we could light with candles and make it feel warm and personal with autumnal colours which we managed to achieve. When we went to see Owen house for the first time we fell in love with it, it’s just got the loveliest feel to it and the staff are brilliant. They make you feel so welcome from the off and particularly Vanessa, Dan, Chris & James. I couldn’t recommend it enough! We were due to fly to Santorini from London so the night before We stayed in London and went to sushi samba for a meal as id always wanted to go. He then surprised me with tickets to go the viewing platform of the shard. I was none the wiser, we went up and spent around an hour looking around – what I didn’t realise was that the floor was clearing out whilst we were there! It ended up being only me and Chris, my favourite song playing, candles and flower petals on the floor and a photographer hiding round the corner! Turns out he had been planning it for 6 months & had hired the top floor of the shard out to propose! I was gobsmacked and it was just perfect. If you had to pick a favourite moment from the whole day, what would it be? Favourite moment of the wedding, it’s so hard to pick! If I had to choose it would be walking down the aisle with my dad, seeing Chris smiling at the bottom and having everyone I love around me. What advice would you anyone planning their wedding? Advice – take every moment in. It’s so cliche but the day goes SO fast and it’s over before you know it. Also – hire a videographer!!! It will enable you to look back at your day and remember all of the little things you have forgotten and the things you don’t see! You spend so much time and money on one day it makes sense to have it documented so you can look back on it for years to come!! This just shows how bad weather does not ruin a great wedding! What made you pick The Titanic Hotel? It was just so cool and dramatic. It had all of the features that we love – exposed brick, greys, that industrial yet classy feel. It felt like somewhere that we would want to spend a lot of time. The service was slick but you felt comfortable and not uptight. I was about to work away for 2 months, so the week before we took some time off. I wanted to propose before I went but by the time the ring arrived I only had one day. I tried to arrange to go somewhere nice, but Hannah just wanted to “stay at home all day”! I eventually got her to Speke Hall and had to hope there would be an opportunity. Luckily it was a nice day, and we found ourselves alone sitting on a bench in the gardens. I had prepared a poem (yes, another poem!) about things that Hannah loves, other than me, and in the last verse I got down on one knee and delivered the big words! After she had calmed down, Hannah was fuming that no-one was around to clap! What was your favourite memory of THE BIG DAY? So difficult to pick highlights! Walking down the aisle – both ways! The fireworks. Chatting to people in between courses of the wedding breakfast. The speeches. The band. The midnight pizza! At the end of the night once everyone had gone, we sat for ages outside on the colonnade with family, and it was just so nice reflecting on the past 24 hours! What advice would you give to any couple planning their wedding? – If you want the groom to help, give clear and precise instructions, and one job at a time! – Set out a clear vision of what you want, and not what anyone else wants. – Don’t discuss the plans with too many people as everyone has an opinion but it is your wedding! Also it keeps it a surprise for your guests. – Social media groups often have things for sale for a good price that you can then resell again. – Have days off from wedding planning! We chose Thornton Manor for a number of reasons; firstly the ceiling in the music room reminded us of our first holiday together when we visited the Sistine Chapel, the exit of the music room looks like the wardrobe from beauty and the beast!! Being a huge Disney geek I loved this. The grounds themselves are beautiful and the whole Manor House itself is simply stunning, romantic and perfect. What are your favourite memories from the whole experience? When I walked into the ceremony room and saw Gary. In all honestly I don’t remember what the room looked like. The only thing I could see was Gary. Spending the time on our own during the pictures was amazing. Of course the speeches- have one of my oldest friends walk me down the aisle and do a speech is a little unconventional so I was worried about his speech but it was perfect! Gary said his favourite memory was seeing me walk down the aisle and walking into the music room together passed all of our guests. Take full advantage of your wedding party, get them making favours and on the day before your wedding turn your phone off and divert all calls to your chief bridesmaid. You don’t want to be stressed out with guests and suppliers calling so get them to call the groom or a bridesmaid! Don’t worry about the small stuff. I had espresso martini split on my dress, my dress strap broke, the cake was wonky, out canapés were wrong and Gary’s pants split! But it was without a doubt the best day of our lives!